move between multiple screens every day, many with touch capabilities, we’ve become accustomed to tapping, swiping and zooming to get things done. We’ve received a lot of positive feedback about the touchscreen on the Chromebook Pixel, and over the past year we’ve made optimizations to Chrome OS to make touch actions simple and intuitive — our customers find themselves reaching out to tap an OK button, scroll through a page or zoom into Google Maps. 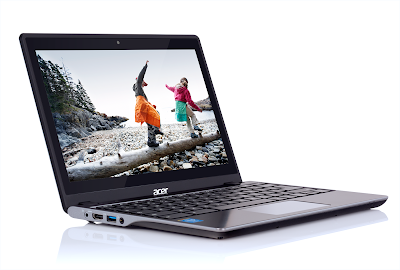 As part of this immersive, tactile world, Acer has announced the new Acer C720P Chromebook with a multi-touch screen, adding the second touch-enabled Chromebook to the lineup. Acer’s Chromebooks are consistent best-sellers on Amazon, and this new device will help more users experience the best of the tactile web for just $299. The Acer C720P is available for preorder now at Amazon, and the device will hit store shelves in the U.S. and additional countries from this week onwards. As 90 percent of people move between multiple screens every day, many with touch capabilities, we’ve become accustomed to tapping, swiping and zooming to get things done. We’ve received a lot of positive feedback about the touchscreen on the Chromebook Pixel, and over the past year we’ve made optimizations to Chrome OS to make touch actions simple and intuitive — our customers find themselves reaching out to tap an OK button, scroll through a page or zoom into Google Maps.